Aquavit or Akvavit is a Scandanavian spirit that's enjoyed during the winter holidays. It is easy to make, and inexpensive. All you need is vodka and a few herbs and spices. The primary flavor in Aquavit is caraway seed, but cumin, coriander, fennel and dill are common ingredients. The best thing about making your own Aquavit is the fun of experimenting with your botanical blend and ageing times. 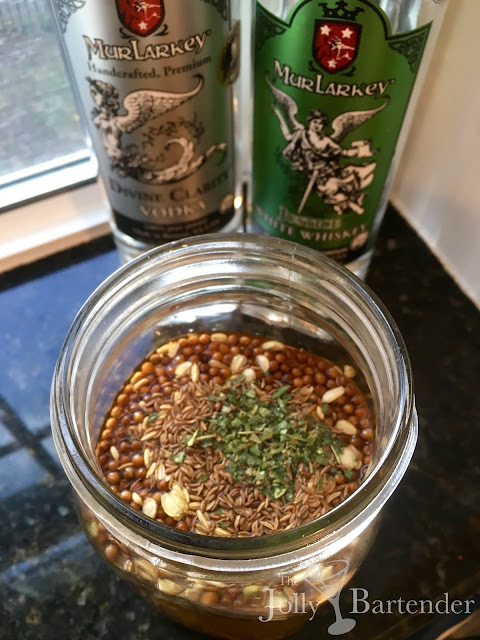 I usually use about three tablespoons of caraway, cumin, coriander and fennel in a bottle of vodka like Smirnoff 57, which is 100-proof and can really absorb flavors quickly. Store this in a sealed container in a cool dark place. I remove the solids after about two days to a week. This is my third batch of Aquavit and I'm doing things differently. First I wanted to get away from an entirely neutral grain base. MurLarkey Divine Clarity vodka is pretty tasteless, but it is made from potato. I used two cups of this vodka. (Note: any clear distilled spirit can be used to make Aquavit as long as it is not already flavored.) Then I used a cup of MurLarkey Justice white whiskey. It has a grassy taste of a young whiskey that I think will compliment my botanicals. Speaking of...in addition to the usual caraway, cumin, coriander and fennel, I added Icelandic birch leaves for dry earthiness and angelica seeds for floral spice. This should be an amazing batch this winter and I am excited to see how it turns out!